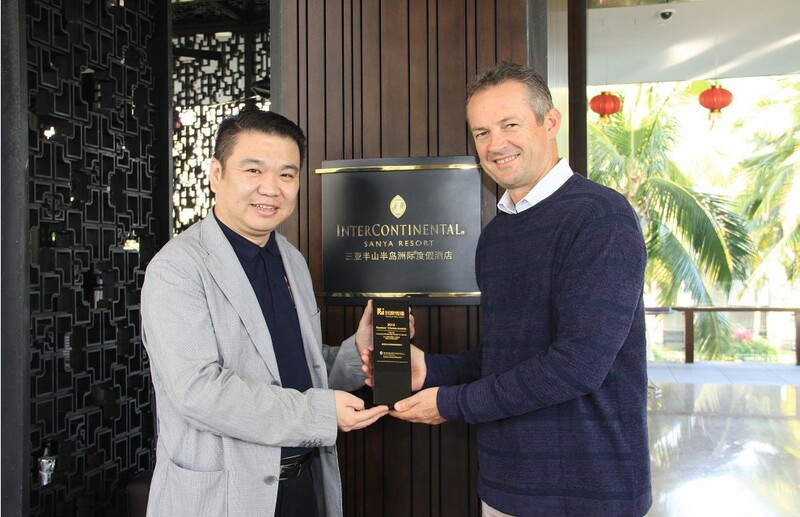 Mr. Geoffrey Ryan, the General Manager of InterContinental Sanya Resort received the Top 10 Luxury & Preferred Hotels in Hainan Award from Mr. Huang Lei, the Executive Vice President of Traveler Media Group. InterContinental Sanya Resort starts off the Year of Snake by winning 2 Awards from Traveler Media Group Readers’ Choice Awards 2012- Top 10 luxury & preferred Hotels in Hainan and Top 10 Luxury Hotel Restaurant in Sanya. Ms. Ada Ning, the Operation Director of Chinese Restaurant received the Top 10 Luxury Hotel Restaurant in Sanya Award from Mr. Huang Lei. Opened in July 2010, InterContinental Sanya Resort occupies one of the most beautiful locations in Sanya – Xiao Dong Hai, surrounded by sandy beaches and green mountains, offers guests picturesque views from every room. Beautiful water features and water gardens throughout the Resort create a serene yet stylish ambience. The Resort offers 343 rooms including 24 beachside villas & 12 executive suites. Guests can lounge in 5 swimming pools, dine in 7 restaurants and bars, unwind in soothing SPA InterContinental or choose from 1 ballroom and 7 inspiring meeting rooms.